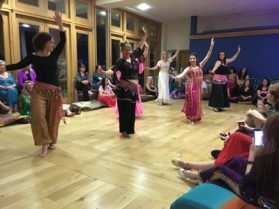 I’m delighted to join the teaching team at the JWAAD Summer School again this year to help deliver the UK’s best ever residential Belly Dance school. It offers a week long submergence in everything Belly Dance, but you can also join just for just the weekend or five days if your prefer. No matter which option you chose – it’ll be a dance holiday like no other! The time table is crammed full of exciting and varied workshops at all levels. You may find it hard to also find time to shop in the amazing souk, but it’s not to be missed, and neither are any of the many evening socials and parties. Read more and book your place on the JWAAD website here.